Valley shoppers are being advised to check their freezers after several local grocery stores allegedly sold meat at the center of a national recall. The United States Department of Agriculture announced on Monday that it has expanded what it classifies as a "high-risk recall" for raw beef produced and distributed by JBS Tolleson Inc. to retailers that included chains such as Walmart and Kroger. The original October 4, 2018 recall now includes an additional 5,156,076 pounds of raw beef products, which were produced and packed from July 26, 2018, to Sept. 7, 2018. A list posted to the USDA's recall information says that as of October 25, 2018, several Valley retailers had sold the ground beef. 21 News spent the day reaching out to the Sparkle market locations, both Rulli Bros. markets, Nemenz IGA, and half a dozen Save-A-Lot locations. Managers at all of those locations told 21 News that they do not use JBS Tolleson products as of now. In addition, 21 News also reached out to larger retailers. However, they have confirmed at this time that ALDI did not receive any of the impacted beef in any stores, and are therefore not part of the current recall. Spokespersons from Giant Eagle responded similarly, saying that they did not receive products from JBS Tolleson. The USDA says the products were not sold at Walmart stores in Ohio. The Food Safety and Inspection Service is concerned that some product may be frozen and in consumers’ freezers. The products should be thrown away or returned to the place of purchase. The recall is part of an investigation of a Salmonella Newport outbreak being conducted by the FSIS and the Centers for Disease Control and Prevention. The investigation has identified 246 confirmed case-patients from 26 states with illness onset dates ranging from July 26 to September 7, 2018. An additional three cases have since been traced back to JBS Tolleson, Inc., EST. 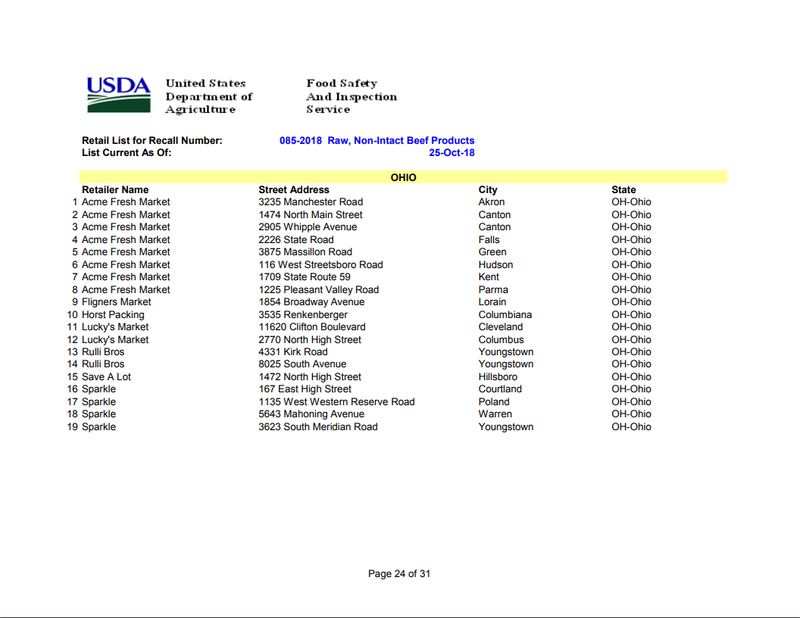 267 ground beef products that were not part of the October 4, 2018 recall. Eating food contaminated with Salmonella can cause salmonellosis, the symptoms of which include diarrhea, abdominal cramps, and fever within 12 to 72 hours after eating the contaminated product. The illness usually lasts 4 to 7 days. Most people recover without treatment. In some persons, however, diarrhea may be so severe that the patient needs to be hospitalized. Older adults, infants, and persons with weakened immune systems are more likely to develop a severe illness. Individuals concerned about an illness should contact their health care provider. In addition to discarding the product associated with this recall, consumers can protect themselves by always cooking their raw meat to a safe internal temperature, which is measured by using a food thermometer. The cooking process kills the Salmonella. No one should be eating partially cooked or raw meat. Additionally, it is essential that people wash their hands after handling raw poultry, meat, and pet food to avoid cross-contamination. The raw, beef items, including ground beef, were packaged on various dates from July 26, 2018, to Sept. 7, 2018. People with questions regarding the recall can contact the JBS USA Consumer Hotline at (800) 727-2333.